Sam Bewley is just 22, but he's been a mountain biker, a road man, a national champion, world champion on the track and an Olympic team pursuit medallist. 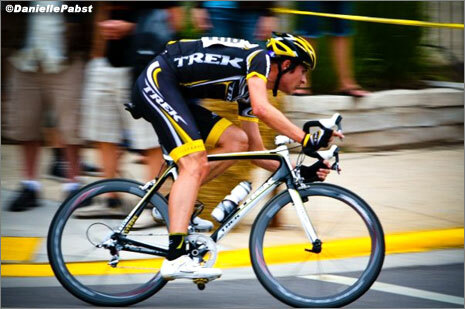 Now, he's with Lance at 'The Shack,' after a year at LiveSTRONG; here's what he had to say to PEZ recently. The U23 Paris-Roubaix was the first time I had ever ridden on the cobbles. Of course I knew what to expect, everyone does when it comes to that race, but I can see for sure now how experience helps so much in a race like that. The race itself is amazing, the history behind the race and the history behind those cobbles, before people even started racing bikes on them, the history of the showers, everything. I was happy with my performance in the race and watching Taylor win it in his first attempt for Trek-LiveSTRONG was something special in itself. Sam recovers after a hard day. 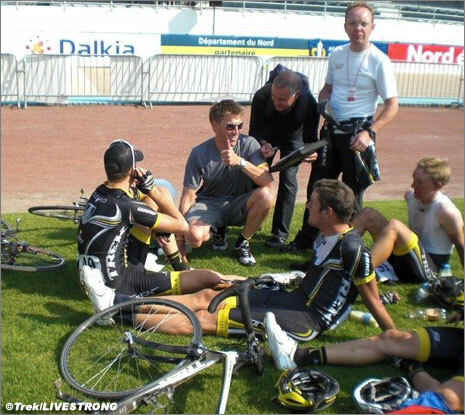 Axel Merckx congratulates his boys following a great race and victory for the team. 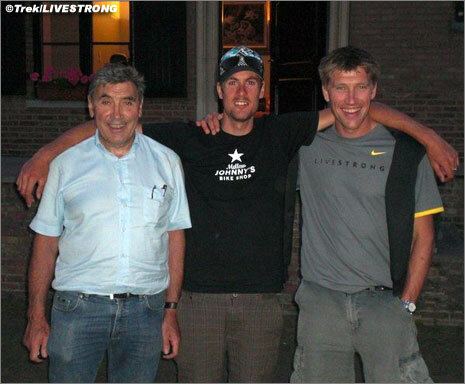 PEZ: Tell us about your 2009 programme with Livestrong. 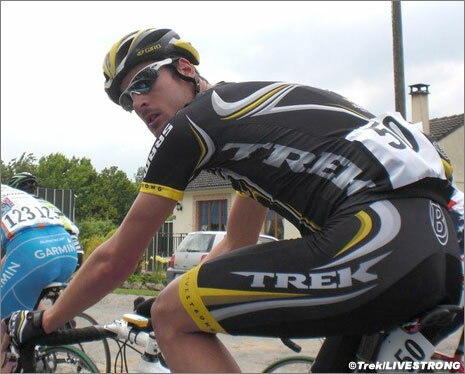 Being part of Trek-LiveSTRONG was really my first involvement with a specific road team. I have spent a couple years racing amateur in Belgium and France, but on each occasion just with the national programme. To be perfectly honest, I struggle to think of a team that is better for developing as a professional cyclist at a young age than Trek-LiveSTRONG. And by the sounds of it, the team is just going to get better and better. Sam with Eddy and Axel. Wow. To be involved with a guy like Axel Merckx is incredible, I personally never stopped learning from him and after spending a season under him I have grown so much mentally and physically as a bike rider. If you can't learn from a man like him, you can't learn from anyone. It's a team targeted at developing young guys, the right way, it's exactly what that team does! PEZ: How do you dovetail road and track preparation? I'm a firm believer that they do go hand in hand, maybe more so than some people think. Sure there are going to be times where you need to spend some specific time on the track, especially as a team pursuit rider, as it is an event where technique plays a huge part. But racing the road full time also builds the engine and develops you like no other form of cycling; so it is crucial, I believe, to being a fast rider on the track. It's easy enough to tie it all in. At the end of the day if you're racing hard road races, tours, classics, whatever, for months at a time, then you are developing - developing for any form of cycling. Then all you need is a few weeks on the track here and there with some specific training and that's a combination that will get the best out of cyclist. Sam is a firm believer in track and road racing going hand in hand. PEZ: In 2005 you were Worlds junior pursuit silver medalist - you didn't pursue that direction, though? Yeah, I won the silver medal at the Junior Worlds in the individual pusuit. 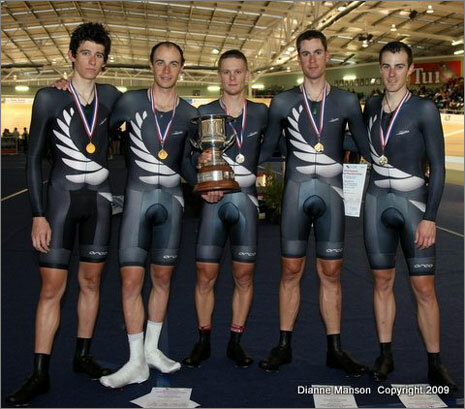 But the same year myself, Westley Gough, Jesse Sergent, and Darren Shea won the Worlds junior title in the team pursuit. At that time our national programme was very much team pursuit focussed, so when I joined the senior team, my focus became the team pursuit. 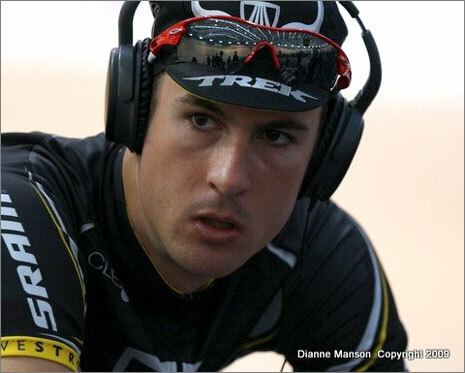 Sam readies for the team pursuit. I chose it to be my focus, It was an event New Zealand had always been good at, but never great; but I could see some changes happening in the programme that were going to make us a great team. In the space of a year we went from riding 4.07 to 3.57 and winning the Bronze medal at the Olympics. I guess I have just always been embedded in a programme built around that event; so I really didn't ride individual pursuit for two or three years. The last six months though, I have started to ride a few more of them and have done some good times and believe I have the potential to go quicker - I want to go quicker! But the team pursuit will still remain the focus, especially with the recent changes to the Olympic programme. 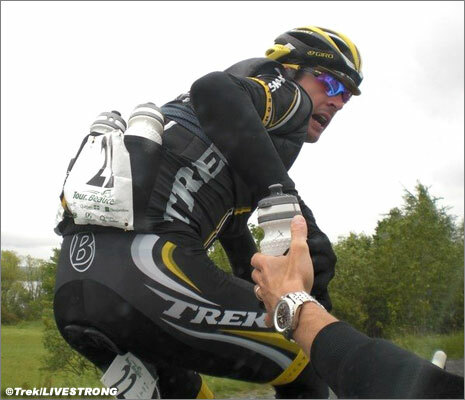 Sam grabs some bottles at last summer's Tour de Beauce. PEZ: You were a mountain bike man originally, why go skinny tyre? PEZ: How does the full 2010 programme look? Team RadioShack is a great team. After spending only one week with the team I can see straight away why there has been so much success with the guys involved. All the Directors are very, very smart men, especially when it comes to younger riders like myself; they know I am young, physically and mentally a lot different to someone five years older than me. Because of this, I am not going to get smashed into the ground. For sure I will be racing a lot and racing some hard races, but they know how to develop a young rider the right way. I'm going to start with Het Volk and Kuurne-Brussels-Kuurne, I'll then race Tour of Murcia, then I will be joining up with the NZ Track team for a few weeks for the World Champs in Denmark. After that I'll be back to some smaller tours with Team RadioShack - Circuit de la Sarthe, Castilla Leon and things like that. I can't wait! 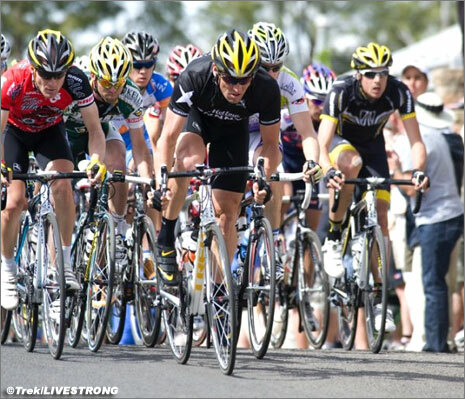 Sam racing hard at the Tour of America's Dairyland in Wisconsin. PEZ: Is London 2012 the big goal? Huge goal. I want to be Olympic Champion!! PEZ: Where are you based for 2010? I am going to live in Nice, France; a little out of Nice, probably. We (NZ) as a country are slowly starting get more and more pro riders in Europe; we are all good mates and understand the importance of having good friends around in a foreign country. Tim Gudsell has been living there for a time now, so myself and Hayden Roulston are going to move there also. It's good for us to be close; It's good for our partners and girlfriends too, they can hang out and go shopping or whatever they do when we are all away racing. PEZ: What's your role at The Shack? This year is basically going to be a year of learning; the Pro Tour is a big step up from anything else I have done. But there is no team better to be involved in as a neo pro. I'm going to learn as much as I can, race as hard as I can, and do anything to ensure somebody from Team Radio Shack gets a result in all the races I am part of. PEZ: Is a Grand Tour on your "wish list ?" I think it's on everybody's wish list, isn't it?! Of course riding a Grand Tour is a future goal. But I am not an idiot, and I know there has to be physical and mental development before you can compete well in a race like that. So, in a couple years when I am at that level, I would love to be in a Grand Tour. PEZ: The Shack camp - a bit intimidating; all those big names? At first I thought yes, but I didn't find it intimidating when I was there, because everyone was so welcoming. All the older guys and well known guys made an effort to make the newer and younger guys feel welcome - and I did. I made sure I had a chat to everyone and got to know them as well as I can. It would be a pretty plain year if I didn't make an effort. 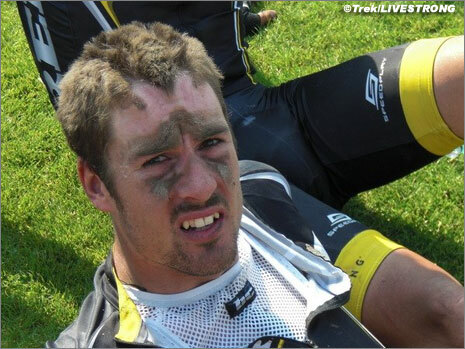 PEZ: Who looked sharp at The Shack camp? It was December so no one obviously was in tip top condition, but there were a few guys who were looking good. The guys were starting to kick start there training and mose people seemed motivated for the season to begin. PEZ: Tell us, does Andreas Kloden smile? It's a cool team, everyone gets on well and everyone jokes together; Andreas is a good guy and a hard case. I liked him, he is always chatty and a good guy to be around. PEZ: Lance - what's he really like? 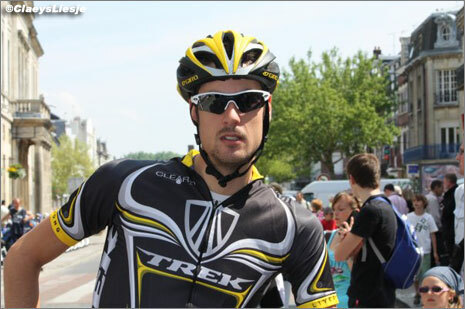 He is a pretty inspirational guy that is for sure; a man who lifts the spirits on the riders and the staff. What he has done in the sport and with his cancer foundation is pretty exceptional and everyone respects that. For a young guy like me, being aroung the sports legend does nothing for me but encourage me to lift my game and learn everything I can. 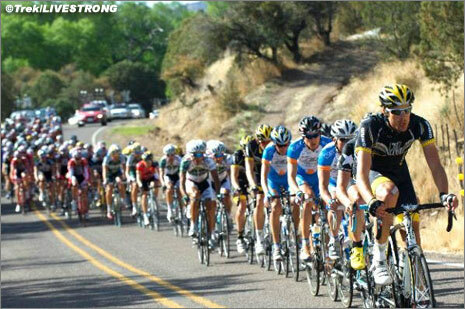 Sam had the opportunity to race with Lance at last year's Tour of the Gila. PEZ: Your NZ team mate, Marc Ryan has done a six or two - is that something you would like to try, one day ? I don't know, Madison is not really my thing. I enjoy riding them, and it's a fun event. But its a specialist event and I don't have any intentions to focus on it. Now it's gone from the Olympics it might make the six day scene bigger, but it might make it smaller. I don't have any intentions to ride any madisons yet, perhaps later in my career I'll think about it. With thanks to Sam for that peek through The Shack window - and all the best to him for 2010.